Salads are the ultimate diet food. But don’t be fooled! Salads may not actually be as healthy as the seem… heavy, creamy, and high-sodium dressings are often the demise of an otherwise “healthy” salad. This avocado-based dressing, however, is not only a diet-friendly, but a great way to enjoy a rich and creamy salad dressing without the extra fat and unwanted cholesterol! Requiring just a handful of ingredients found in any kitchen, I made this easy (and quick!) recipe as a Ceasar dressing alternative to go with a simple shaved sprouts salad! A healthy and creamy alternative to dairy and or egg-based salad dressings. 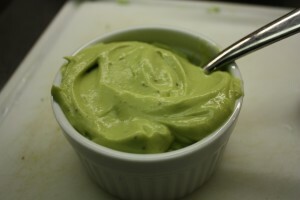 Half, score, and scoop out ripe avocado into a food processor. Add other ingredients (lemon juice, olive oil, water, salt and pepper) to food processor. Enjoy with your favorite salads! More or less water can be used to adjust for desired dressing consistency. Enhance dressing flavor by adding in other ingredients: garlic clove, garlic salt, paprika, cilantro, etc.